Good luck finding a bus after the service cuts. 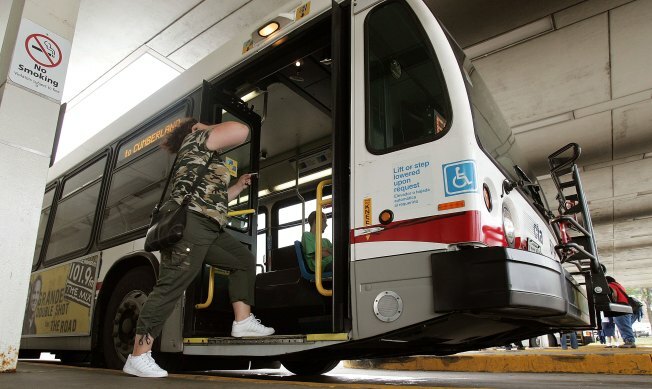 Illinois favors white public transit riders because a disproportionate amount of public funding is channeled to Metra, thus undermining the CTA, according to a lawsuit filed today. Filed in U.S. District Court in Chicago, the civil rights lawsuit is a class action complaint against the state of Illinois, the Illinois Department of Transportation, the Regional Transportation Authority and Metra. The suit claims the funding inequity "has amounted to a pattern of racial discrimination that has negatively impacted African Americans and Hispanics in Chicago for more than 26 years." Because most public funding is channeled to Metra through the RTA, the CTA is robbed of capital-improvement and operations monies. The CTA is thus forced to raise fares and cut services, the suit says. As a result, minorities in Chicago have decreased access to education, health care and jobs because of racial discrimination inherent in the funding formulas for the Chicago Transit Authority, the suit alleges. The plaintiffs are Manuel Munguia, a Hispanic resident of South Chicago, and Dorothy McGhee, an African American resident of the Bronzeville neighborhood, on behalf of all black and Hispanic CTA riders. The suit claims a funding formula adopted in 1983 and renewed in 2008 unfairly benefits Metra, distributing subsidies "on rigid arbitrary bases, rather than on ridership or other need‑based measures," according to Stewart Weltman, one of the lead attorneys on the case. For example, the complaint notes, since 1983, CTA operating funding has decreased from 71 percent of overall RTA operating funding to 59 percent, even though the CTA accounts for 82 percent of all transit trips in the region. And, Weltman says, "tax dollars from those living in the CTA service area have been, in effect, subsidizing the transportation of the residents of the collar counties," which are predominantly white. More than 70 percent of Metra riders are white, while more than 60 percent of CTA riders are African American or Hispanic, a press release claims. While Metra has "flourished" over the last 26 years, the suit says, CTA perpetually faces funding woes, forcing service cuts, fare hikes or both. Metra spokeswoman Judy Pardonnet said the agency "categorically denies" the allegations in the lawsuit and said the funding formula used to distribute funds to the transit agencies is established by Illinois statute. "While one-third of Metra’s stations are located in the City of Chicago, Metra receives no discretionary funds from the Regional Transportation Authority, while the CTA receives 95 percent of those funds," Pardonnet said in a statement. CTA has not yet publicly commented on the lawsuit.